In the final installment of Wenger: The Beginnings we bring you a tale of heartbreak and mystery. The 1992 Cup Winners’ Cup Final. European continental competition is club football’s greatest stage, the final frontier, a pinnacle of achievement. Millions of people around the globe watched Arsenal’s 2-1 Champions League triumph over Barcelona last Wednesday night. This was Arsenal’s first against the ‘best team in history’, and most of all this was a moment to savour for Arsène Wenger. Success in Europe has consistently evaded Wenger, arguably the greatest manager never to win a European trophy. There is no doubting Wenger’s depth of experience in Europe. Even in his modest playing career he managed to appear at centre back in a UEFA Cup tie for RC Strasbourg in 1979. His selection there was out of desperation, the youth team coach called into the side against Duisberg, only to see his side lose 4-0. As a manager though, he is a veteran, playing teams in Europe since 1988, and leading Arsenal into the Champions League every year since 1998. However, the pain of those campaigns which never quite lived up to expectation still lingers. 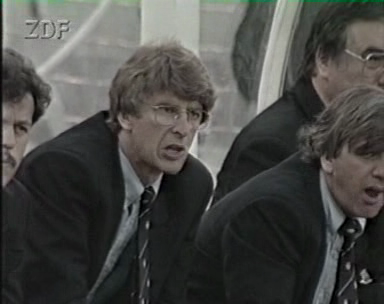 Wenger and Jean Petit on the bench during Monaco’s 1992 Cup Winners’ Cup final in Lisbon. Wenger’s first European final came in the 1992 Cup Winners’ Cup. After missing out on the 1991 league title to Marseilles, Arsène had to be content with taking the Coupe de France, providing Monaco with a crack at the Cup Winners Cup in 1991/92. The Cup Winners Cup was subsequently absorbed into the UEFA Cup, which now goes by the moniker Europa League, but its predecessor had a respectable history. Ferguson’s Manchester United lifted the title the previous season in 1991 after a 2-1 win over Barcelona, and George Graham’s Arsenal would famously triumph in the same competition in 1994 against Parma. Monaco’s 1992 European run coincided with a glorious season; pushing Marseilles close in the title race, alongside a run to the final of the Coupe de France. George Weah was in sparkling form up front, scoring 18 goals in the league, whilst upcoming starlet Youri Djourkaeff scored 9 from midfield alone. This was Wenger’s third attempt in Europe; having lost 2-1 to Galatasaray in the European Cup Quarter Finals of 1989, and 4-2 in the 1990 Cup Winners’ Cup last 16 against Torpedo Moscow. He was determined to use this opportunity to win a European trophy for Monaco, with his strongest side since joining from Nancy in 1987. The 1991/92 tournament began emphatically enough with a 10-1 aggregate win over Swansea City, whilst Monaco went on to defeat both Roma and Feyenoord. Arsène’s Monaco were paired against German side Werder Bremen in the final, a team growing in strength under Otto Rehhagel, the manager who later ‘achieved the impossible’ in winning Euro 2004 with Greece. Otto had turned Bremen into a footballing force in Germany using the same kontrollierte Offensive philosophy which, although contrasting somewhat starkly with Wenger’s attacking philosophy, had propelled Werder to the fore in the Bundesliga. This same team were to win the Bundesliga title the following season, 1992/93. Wenger’s first European final was to be played at the Estádio da Luz in Lisbon, Portugal, the country where he spent the previous summer watching the 1991 under-20 European Championships with a certain Gerard Houllier. As ever Wenger was consistently putting the hours in meticulously researching the future stars of Europe, and three young players destined to make their mark on European graced the Monaco side of the 1992 final; the legendary Emmanuel Petit, Youri Djorkaeff and Lilian Thuram. A young Emmanuel Petit, playing at centre back. In hindsight this is a crucially significant game in Wenger’s Monaco career; the prelude to a storm. The final itself was overshadowed by events in Corsica, where a temporary stand collapsed during the Coupe de France fixture between Bastia and Marseilles. Eighteen people died, and 2,300 were injured. Monaco immediately decided not to go ahead with the final, and UEFA agreed at first, but inexplicably changed their minds. “Arsène was inconsolable. He asked what we were doing over there. We were about to play a match in Portugal, when football had been, well, killed by this tragedy”. Arsène did not allow the Monaco players to leave the hotel; instead they were hidden away from the journalists hovering for comment, whilst Wenger travelled to Corsica to pay respects to victims. The lives of those who died would be on the players’ minds during the final. 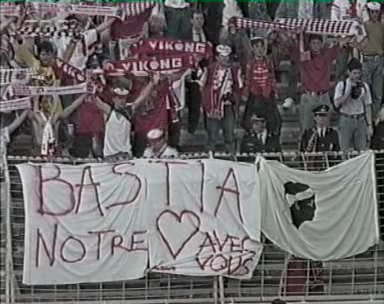 Monaco fans send a message to Corsica. The final itself was a rather odd affair, an anti-climax. Both clubs took relatively few fans; only 16,000 attended the game, a paltry figure considering the 44,000 who had crammed in to watch Manchester United overcome Barcelona 2-1 in the previous year’s final. The empty Estadio da Luz in 1992, a ‘flat occassion’. Arsène gave his sides chances as 50/50 in his prematch interview, and his line-up was strong, with Patrick Valéry and Luc Sonor as the right and left back respectively. Emmanuel Petit was named as centre back partner to Mendy for the day. In midfield the skilful Gérald Passi was paired with Marcel Dib, whilst Jérôme Gnako played down the right, and the speedy Fofana be preferred to play wider on the left, using his pace in attack. The number eight, Rui Barros was positioned more centrally, behind George Weah playing up front. In effect Monaco lined up with something akin to a 4-4-1-1, although in some respects it could even be described as a 4-2-3-1, a theme explored in Wenger’s earlier European campaigns. The formation was generally fluid, incorporating Wenger’s persistent obsession with pace. Monaco took to the field with a high line, pressing and making use of the overlapping full backs. Werder meanwhile played true to the kontrollierte Offensive, putting almost no pressure on Monaco, instead relying on the physicality of the defence including Uli Borowka and Thomas Wolter. Offensively they looked to launch lightening counter attacks, sporadically raiding into the Monaco half. Monaco press – Sonor and Valéry (yellow) made forward runs alternately, whilst in blue Petit (near) and Mendy (far) marshalled the back line. Dib in the holding role is marked green. Les Monagesques dominated the early phases, although there were few clear chances. Fofana looked dangerous on the left, pacey as ever, whilst Sonor and Valéry pushed upfield leaving Petit and Mendy in defence. In midfield Marcel Dib played the holding role, distributing passes to the front men, with Passi alongside him. However, set pieces and crosses into the box were the main threats to Werder as Monaco exploited the flanks. Throughout the game the interchanging of positions in the Monaco midfield was emphasized. Weah would sometimes move onto the flank and Gnako would come in to the centre. With Weah in the centre Monaco would lob balls over the top in an attempt to pit Weah’s pace against the Bremen defence. Consistent pressure does produce results, but also crucial weaknesses. Bremen kept the door firmly shut on Monaco’s advances, and then proceeded to close the first half with a goal. 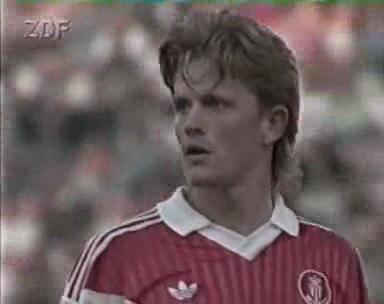 A looping freekick from Bremen’s half found its way into the Monaco box, and Petit lost out on the header. With the ball bouncing inexorably forwards Mendy was wrongfooted and hero Klaus Allofs pounced on the half volley, searing past Jean Luc Ettori. In the second half Monaco employed an even higher defensive line as they pushed for a response to Werder’s opener. The flanks were again exploited heavily, as the fullbacks looked to cut the ball back from the byline into the box. The right flank was key with passing triangles and link up play between Weah, Barrios and the number seven Gnako. However their efforts were in vain, as a second Werder goal came. Petit pushed forward pressing Werder at the halfway line in an attempt to win the ball, but he lost the tackle; left sprawling on the floor. Allofs picked up the loose ball near the centre spot and picked out Wynton Rufer making a forward run, playing a simple ball over the top as Rufer ran between Valery and Mendy, neither of whom tracked back. Monaco were picked off in a moment of counterattacking perfection, all that was required was a mistake and the high line was exploited to the fullest extent, Ettori was again left helpless as Rufer made it 2-0. 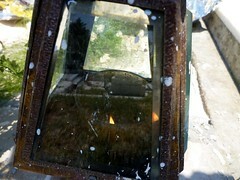 The second goal. Klaus Allofs made the pass from the halfway line to the onrushing Rufer (pink), between Mendy and Valéry (yellow). Monaco’s high line in effect. Monaco became increasingly desperate as Wenger’s side searched for a way back into the match, but against Rehhagel’s controlled tactics the frugality was the theme. Monaco’s pressing only increased, whilst Fofana came off, replaced by Benjamin Clement and right back Valéry for the young and highly talented Youri Djorkaeff. Now Djourkaeff held the centre of the pitch, mesmerising spectators with his range of passing and talent on the ball. Dib fell back to cover right back when needed exchanging with Gnako, adapting to the situation as Werder sat back and Monaco pushed everyone forward. In terms of formation the side became amorphous, Clement playing up front, on the left and right, with Dib and Djourkaeff drifting in the centre. Although Monaco were now desperately pushing for a goal, their efforts lacked the quality final ball to penetrate the layered Grün-Weißen defence. Werder had every man behind the ball, and only pressed when Monaco managed to reach the final third; thwarting their forays forward. A young Youri Djourkaeff can’t break through Rehhagel’s defence. Bremen continued to look for the positions to break, and they were constantly found offside as they attempted through balls into the channels, although by the end they were often simply punting the ball downfield. Monaco showed flair at times, knocking small one-twos and triangles on either flank, and time and again Djourkaeff looked to pull off moves with slick skill, but overall lacked an end product. At the final whistle the players collapsed on the pitch, overcome with the emotion of the moment, undoubtedly drained. There is sparse footage of Wenger and Monaco wallowing in the pain of defeat as the Bremen players celebrate ecstatically in front of their 5000 travelling fans. “When you have lost the final of the European cup, you have hit rock bottom”. Otto Rehhagel and Werder Bremen celebrate their 2-0 victory. Ultimately Wenger’s first European final was Otto’s day, the culmination of his teambuilding efforts at Bremen, in the long term this result set a pattern for Wenger’s European credentials. Of three major European finals he has won none. The second attempt came against Galatasaray, where Arsenal lost 4-1 on penalties in the 2000 UEFA Cup final, allowing a Turkish club to win a European trophy for the first time, whilst losing to Barcelona in the 2006 Champions League final was yet another painful day. The 1992 final has always been used as the reflecting pool for Wenger’s time with Monaco where he established a great team playing good football, but fell short; always second best. Despite Wenger’s first League title in 1988 and the Coupe de France triumphs in 1989 and 1991, this still holds true for the 1992 season. Monaco qualified for two finals, and were fighting for the league title with Marseilles. However, due to the tragedy in the Bastia semi-final, the Coupe de France final was cancelled, whilst finishing second in the league to Marseilles. It would take another year for the Tapie bribery scandal to explode, as far as anyone knew Marseilles were simply too good for Monaco. It was a trophyless year of frustration, and the beginning of the end for Wenger’s great Monaco side. 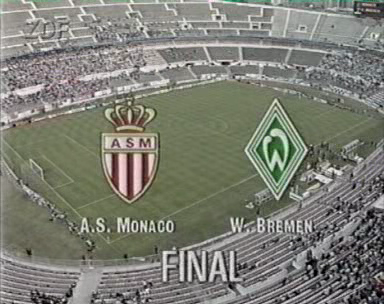 Indeed, the Werder game was Weah’s last major appearance for Monaco. The frustration of the experience led to him signing for PSG in the summer of 1992, whilst Gérald Passi moved to St Etienne. Here there is a contrast with the current Wenger side, where teambuilding has been sustained, the experience with Monaco stood Wenger in good stead. Jean Petit assistant manager emphasized the frustration at the inability to build the team, something which has become almost an obsession for Wenger, as apparent today as ever. Wenger’s first great side never recovered to their former heights, eventually culminating in his departure from the club in 1994/95. Ironically his fate was intertwined with that of his first European final opponent, Otto Rehhagel. In 1994 Bayern Munich approached Wenger to become manager, but when he decided to honour his Monaco contract Bayern hired Rehhagel in his place. Wenger was subsequently sacked and missed the opportunity at Bayern, moving instead to Japan, and Nagoya Grampus Eight. At Arsenal the story has unfolded rather differently, but the tug of Europe abides. Still the belief persists that Wenger can triumph on the continental stage. Defeating Barcelona’s superlative side has added weight to Arsenal’s credentials this season, an undoubtedly brilliant performance, but if the hard work of the first leg comes undone at the Nou Camp Wenger will have to wait yet another year for his chance at European glory. Top Top post buds, Great read !!! Thanks Jay – I try my best to make it interesting. Vive la France. But question remains……will arsene ever win european cup with his current attacking philosophy?? One thing remains same, high defense line. We were a touch lucky barca couldn’t exploit us. But at camp nou….i don’t know. I think Wenger has grounds to claim he has been unlucky, every final he has contested has been very, very close. Plus add to that the fact that neither Monaco, nor Arsenal are really established European trophy winners, and his record looks very good. Arsenal have had the potential to go all the way in Europe on several occasions, but in a cup competition you don’t always make it there. The potential exists, and I’m not sure if it is tactical philosophy foiling Arsenal, as much as simply not being as strong as the opponent. It either takes another club to knock those out, or Arsenal to do the unthinkable, i.e. beating Real at the Bernabéu in 2006, or Barca 2-1 this year for them to make headway. The spine of Wenger’s team is bafflingly poor, which may account for the lack of trophies in the last 5 years. C.Def is constantly full of people who are either too small, or to mentally and physically weak. He has never replaced Adams/Keown/Bould/Campbell, a fact acknowledged by the re-signing of Sol last year even though he was far too old. C. Mid – Viera and Petit left and were replaced with some flair and passers but no hard men, no Makelele or Roy Keane figure, just some more who are not physically strong enough or defensive minded enough. Indeed, that is what links all of the above weaknesses together – Wenger can’t spot the spoilers, the stoppers, he only can see beauty and creativity. He needs some steel in his side. Let us remember it’s not enough to be a very attractive team and play the best football in England. Someone in Catalunya is playing the same style and winning up to 6 trophies a season. Pep Guardiola is beating Wenger at his own game. That is what hurt last year, and why the return in Camp Nou will be such a big game. A very interesting viewpoint – but I can’t agree with everything you say. On the spine issue – I think it is there – the way Wilshere played the other night is pleasing, Fabregas never stops running for the side, and in Djourou and Song this team has enforcers. I would agree that Lehmann was never replaced, but that is changing with the emergence of Szczęsny this year, and the improvement in Fabianski. What we have seen is a team in transisition since 2005ish, but one that has been competing for a title in the Premier League and Europe three out of four seasons since 2007/08. On central defence you are wide of the mark – Adams, Keown and Bould were replaced by the Invincibles of Toure and Campbell, and whilst the defence was in transition last season with the likes of Silvestre and Campbell as stop gap signings this was only due to extreme injury troubles – the fact that Djourou has been at the club for years, and Vermaelen made most appearances of any player last season reveals the well constructed base, with the addition of Koscielny as another for the centre, Squillaci more as cover. In midfield I think the game has moved beyond the style of the late 90s, early 2000s, and the components of box to box Vieira style play have been spread across several positions. In any case Song has more than filled the positional problems. In terms of the spoilers I would argue where are Barca’s? You’re right about Barcelona, but remember that their current success is recent, and built off the back of a sustained team-building project begun in the 2000s – a process which Arsenal are still in the relatively early stages of, maybe seven years behind. Not everything is perfect in this squad, but they remain competitive. You identify valid weak points, but what we have seen over recent seasons is Wenger patiently reconstructing a side which is growing in strength. Keeping them together is another matter, and waiting is frustrating, but in some ways the blossoming of this team is the most satisfying part – just look at the progress they are making. a very informative blog, which still remains the front page of my internet browser. watch out for the doping scandal that will surround the Barcelona football team in the near future. I strongly believe we (Arsenal) have made steady progress this season. The only real concern is the loss of three key players due to injury. Cesc, Theo and RVP are going to be sorely missed.